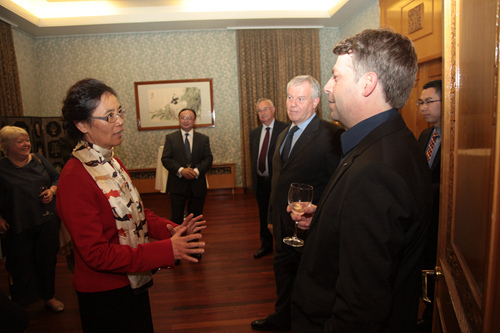 On the eve of the 65th National Day, Ambassador Liu Xiaoming and his wife held a dinner for British scholars and scientists who worked or are working in China. 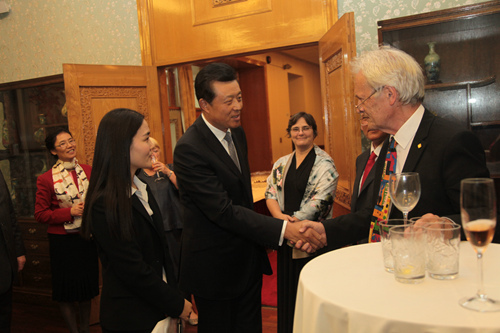 Sir Richard Peto, Co-Director of Clinical Trial Service Unit & Epidemiological Studies Unit at the University of Oxford, Expert of the Fuwai Cardiovascular Hospital of the China National Center for Cardiovascular Diseases and winner of the 2012 "Friendship Award" of the Chinese government, Professor Marie Harder, member of the "Recruitment Program of Foreign Experts" of Fudan University, Alistair Michie, Deputy Chairman of the 48 Group Club and winner of the 2013 "Friendship Award", Dr. Samantha Jenkins, professor at University West in Sweden and Hunan Normal University and winner of the 2013 "Friendship Award", James Brain Hope, designer of GM Europe and Chery Automobile and winner of the 2013 "Friendship Award" and David Roger Jones Owen, Professor at Swansea University and Foreign Academician of the Chinese Academy of Sciences attended the dinner. Minister-Counselor for Science and Technology, Chen Futao and Minister-Counselor for Education, Shen Yang of the Chinese Embassy were also present. Ambassador Liu Xiaoming first welcomed the scholars and scientists who came to celebrate the 65th anniversary of the People's Republic of China and said that they are all friends of the Chinese people and supporters of China's development. He said that the British scholars present come from a variety of disciplines such as medicine, engineering and environmental management. Among them, there are "Friendship Award" winners, Fellow of the Chinese Academy of Sciences and a member of "Recruitment Program of Foreign Experts". He said you all took a long journey to China. You have worked and lived in China for years. You have close links with China and you deeply care about China. You have enhanced China's capacity building with your knowledge and wisdom, enabled China's industrial upgrading, enriched the meanings of China-UK relations, earned respect from the Chinese people and received honors from the Chinese government. Ambassador Liu stressed that at present, China's development has entered a new stage. The Chinese people are striving to achieve the two centenary goals and the 'Chinese dream' that features national prosperity and a happy life for the people. To this end, we need all the more to draw on the strengths of other cultures and civilizations. We must learn from the most advanced science and technology of the world, and need the advice from foreign experts and scholars as much as ever. Therefore China is grateful to you. China also welcomes and hopes to see your continued participation in China's development endeavors which will constantly facilitate the development of China-UK relations. On behalf of the guests, Alistair Michie said in his speech that he has been to 28 provinces in China in the past 21 years. He personally experienced China's fast development and tremendous changes. He congratulated the Chinese on the great achievements in China's construction and felt happy and proud for the contribution he made to China's development. He believes that in 2015, the year of UK-China cultural exchange, the two countries will enjoy more opportunities of communication, mutual learning and joint progress. 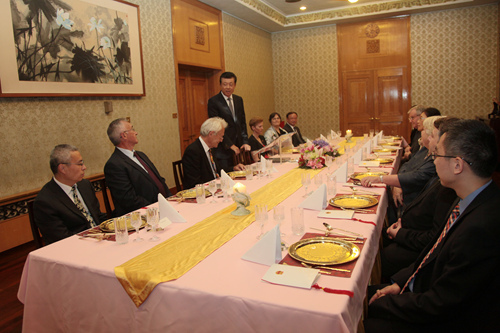 Other experts present at the dinner sent their congratulations on China's 65th National Day. They thanked Ambassador Liu and his wife for organizing such a meaningful and unforgettable event and said they will stay committed to promoting people-to-people exchanges and the bilateral cooperation in various fields.